Sarees Inspired By Daily Life Objects- Shop Now Your Unique Fashion! Saree & blouses with floral prints and scenery prints are pretty common. Can you think of prints beyond this? Something that could be inspired by people, places, culture, cuisine or décor! We are sure you probably haven’t. Inspired by the beauty of lifeless objects around us, the designers of TheHLabel have created statements of lively prints. Our newest saree set collections are all about themes inspired by various aspects of life that are ideal for party, festive and casual wear. To have a better understanding of the artistic fashion work, here are some unique kind of sarees you’ll find only at TheHLabel! Doesn’t this saree look classy? 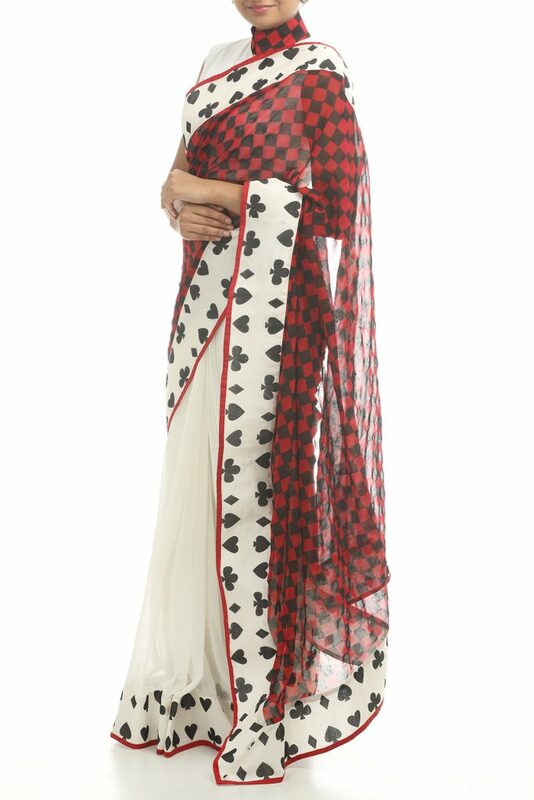 The concept of casino cards & casino colours has been widely used in the creation of this saree. Made from the finest fabric of georgette, this saree is light-weight and easy to carry. Be it for yourself or for your loved ones, this saree can be a perfect gift of the year! Who doesn’t know about a folding fan! But, have you seen this fan embroidered beautifully on any saree? This saree represents a symbol of literati and social status in an artistic way. The colourful embroidery and an elegant cut-dana work enhances the charm of this saree, making it a classy party wear outfit. Hyderabadi chudis (bangles) are a love of every woman in India. In fact, tourists also have a craze for this Deccan accessory. The designers of TheHLabel have taken inspiration from this evergreen love & crafted it beautifully on this emerald green saree. The wide block printed border of bangles elevates the elegance of this saree and makes it an ideal outfit for festive ceremonies or traditional parties. Want to check out more inspiring & unique saree sets? Visit our saree set section today!